Commentary and fight card discussion courtesy of David St. Martin. David is an editor and MMA contributor for SB Nation. You can follow him on Twitter @SaintMMA. 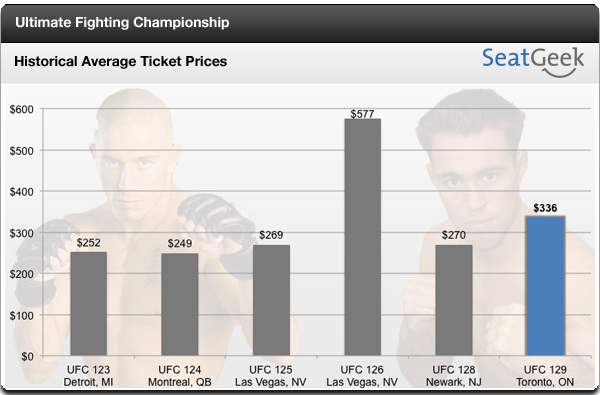 Find UFC tickets right here on SeatGeek.com and learn more about UFC ticket prices from our complete guide. We’ve become accustomed to seeing records routinely broken during Ultimate Fighting Championship’s recent era of success, but this weekend truly marks the beginning of something monumentous. Not only for the promotion, but for the sport of mixed martial arts. As if being the first UFC event in the province on Ontario wasn’t enough, UFC 129 will also be its grandest to date. Boasting a sold-out, 55,000+ crowd of screaming fanatics, Saturday night’s event will shatter North American gate and attendance records, effectively making it the biggest show in the history of the sport. The average ticket price for this event is $336, a good bit higher than the UFC 128 average of $270. Not surprising in the least considering the storylines coming into this weekend. George St. Pierre fighting in Canada. Be it Toronto or Montreal, there’s just something magical about it. The way he pulls his hometown crowd into his corner is dizzying, leaving his opponent feeling like the loneliest man on earth. To question whether or not the crowd will make a difference is silly, but which fighter can use it to his advantage or deflect its onslaught is the real question. While quite a few fighters have fought infront of largely silent crowds in Japan, it’s another thing entirely to see a crowd this size in North America. With the celebration of legalized MMA in Ontario about to kick off, you can count on the Rogers Centre to be in fine form on Saturday night. While this event will undoubtedly be successful in Canadian markets, it may hit some stumbling blocks with its viewers moving south into the U.S. Georges St. Pierre only buys you so much. The issue arises when you take a look at UFC 129’s other characters. Jake Shields, who will face St. Pierre in the night’s main event for the UFC welterweight crown, is an outstanding fighter. Unfortunately, he’s a relative unknown who many fans aren’t giving a fair shake to take this fight. While the UFC’s done an excellent job in packaging Shields as the fighter he probably is, it may be too little too late to sway the popular opinion of the MMA fan collective. If only St. Pierre’s assertions of concern translated to pay-per-view buys. Jose Aldo and Mark Hominick. In UFC featherweight champion Jose Aldo we have a young man who may be the top pound-for-pound fighter in the world. But a reluctance to let the media nibble at him hasn’t helped his story be told. If he ever hopes to carry a card as most UFC champions are expected to, he will have to popularize himself a bit better with the casal fan. Hominick, like Shields, isn’t being considered as a danger to overtake the champion. While this pessimistic feeling could hurt PPV buys, Aldo must see this fight as his opportunity to burst into the echelon of the sport’s top performers. Will fans recognize this fight as the war it could be? We’ll have to see. A legend’s last fight. Former UFC heavyweight champion, former light heavyweight champion and UFC Hall of Famer, Randy Couture, will step into the Octagon for the last time on Saturday night. In a career spanning nearly 15 years, Randy Couture has done more to build the sport of mixed martial arts than perhaps any other fighter in his time. After briefly stepping away from MMA in 2006, Couture will finally hang up the four ounce gloves for good. To send him off into the sunset is the ever dangerous Lyoto Machida. Seemingly backed into the corner after back-to-back losses to Mauricio Rua and Quinton Jackson, this fight is do or die for the former champion. While fans may hope to see Couture’s career end on a high note, it would almost certainly come at the price of Machida’s. Regardless, UFC 129 will serve as a watershed event for the sport and break boundaries once seemingly insurmountable. It’s a shame Couture had to leave just as it was coming. Tickets are averaging $336 for the sold out event. This is a 25% increase over 128 in Newark, New Jersey, which averaged $270. The “get in” price for UFC 129 is $111 for tickets in the mezzanine. Seats by the cage are going for up to $5,000. Of course, tickets for this event are sold-out but you can find listings on the secondary market starting at about $100 (Search UFC 129 tickets).